If you are concerned about duct corrosion, hazardous stack emissions or other environmental factors associated with a fume hood you may want to consider a scrubber. 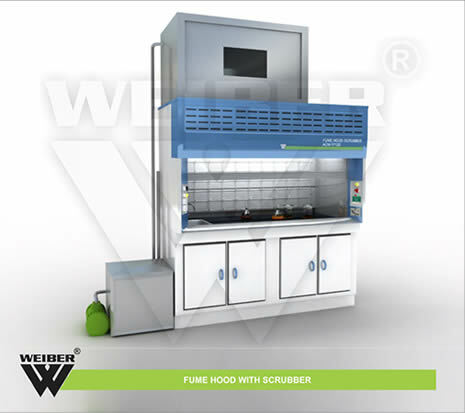 WEIBER Fume Hood Scrubber provides excellent air pollution control for water soluble chemicals present in the laboratory fume hood exhaust fumes. These Scrubber Fume Hood are designed to save space and provide effective air pollution control and operator safety protection for fume hoods. This is especially important for per chloric acid fume hoods, so as to prevent a build-up of potentially explosive perchlorate salts on the exhaust fan, as well as, on the exhaust ducting system. Exellent removal efficiencies: Efficient counter-current gas/liquid contact results in 95-98% efﬁciency for most water-soluble acid and base laden airstreams. Durable: Entire body of scrubber system made of chemical and corrosion resistant polypropylene. Compact: The packing, spray manifold and mist eliminator counted on top of fume hood, pump and reservoir in the base cabinet. This arrangement ensures that minimal extra space is required for the scrubber system. Velocity control of approximately 80-100 feet per minute. Provided with sliding sash made out of special grade shatter proof glass duly framed in wooden/aluminum frame with sliding motion and counter weight balanced mechanism. Illumination level of approx. 800 lux on the work table. Contaminated air from the fume hood enters the unit and passes through a packed bed then through the liquid spray section, a mist eliminator and then into the exhaust system for release outside the building. The scrubbing liquor is recirculated from the sump and back to the top of the system usinga pump. The air and the scrubbing liquor pass in a countercurrent fashion for efficient gas/liquid contact. Water soluble gases, vapors and aerosols are dissolved into the scrubbing liquor. Removal efficiencies for most water soluble acid and base laden airstreams is 95-98%. Particulates are also captured quite effectively by this type of scrubber. Fume Hoods are carefully chosen between industrial grades fire resistant thick PCRC, pre coated corrosion resistant GI sheet. The work table is made of heavy gauge construction material fortified with acid proof glazed tiles/stainless steel grade ss-304 grade. The work bench is provided with a small made of stainless steel ss-304 grade. All modular fume hoods are provided with sliding sash made of special grade shatter proof glass duly framed in wooden/ aluminum frame with sliding motion and counter weight balanced mechanism. Our stainless steel fume hoods are designed with lower noise levels and the performance of these fume hoods are comparatively better than the industry standards of 60db, and approximately 15cm distance from the sash. Our automatic fume hoods make sure that a maximum of 800 lux light is available on the work table through diffuser fluorescent light arrangement. these fume hoods are incorporated with an extremely durable and b exhaust system that generally persists a range of 500-1250 CM. These exhaust assembly comprises of balanced centrifugal impellers that are combined with a heavy duty three phase motor of Crompton greaves. 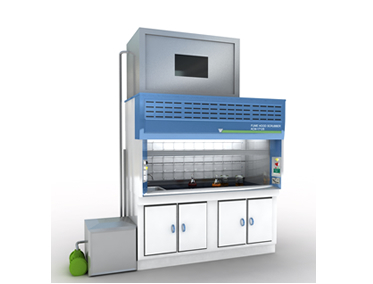 these fume hoods are also integrated with a FRP ducting of required dimension as per the requirements of the user. Our fume hood ensure that the optimum face velocity of 80 feet – 100 feet per minute is maintained with an accuracy of + 10 feet/minute with the sash in complete open position. Our fume hoods are capable of maintaining a constant exhaust volume. The maximum variation permissible due to baffle adjustment, in our in house test procedure is 6% of the given volume of exhaust. Efficiency measured in terms of mass of contaminant removed to mass of contaminants entering the scrubber. Scrubber and mist eliminator installed in special scrubber section at rear of fume hood, accessible from interior of fume hood. Pump and tank assembly mounted on base unit made from corrosion resistant FRP. Scrubber to include polypropylene mesh pads, PVC spray nozzles, PVC piping and fittings and special internal packing. Controls shall include an on/off switch installed on the front of the fume hood. Scrubber system is on at all times when fume hood is in use. Illumination Fluorescent light illumination greater than 800 lux on work table.